If you are wondering how to go about exploring the city of Arles, then Taco and Co has the answer you are looking for. But this tour operator is not merely concerned about providing you transit. It goes beyond that, focusing on eco-friendly and environmentally sustainable transportation. Located just outside the train station of Arles, it is easy to find Taco and co. 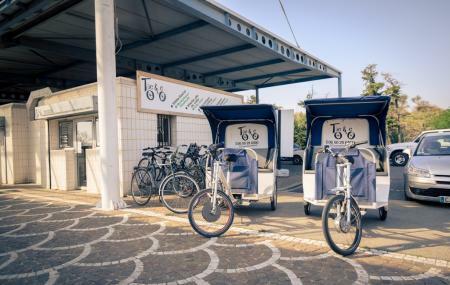 The 4 bike Taco circulate in Arles offers you economic, ecological, personalised and rapid transit. The city of Arles is fascinating and can only be fully be enjoyed and appreciated on a bike. Also with narrow streets and pedestrians, choosing Taco becomes the smart choice. ‘Maxpro Pedicabs’ that can carry up to three people. The most unique fact about Taco is however its creative idea of advertising and innovative communication of messages by announcing events, products etc. through manoeuvring bikes around the city. Bikes won’t be granted without passport as proof. How popular is Taco And Co? People normally also visit Eglise Saint Vincent while planning their trip to Taco And Co.